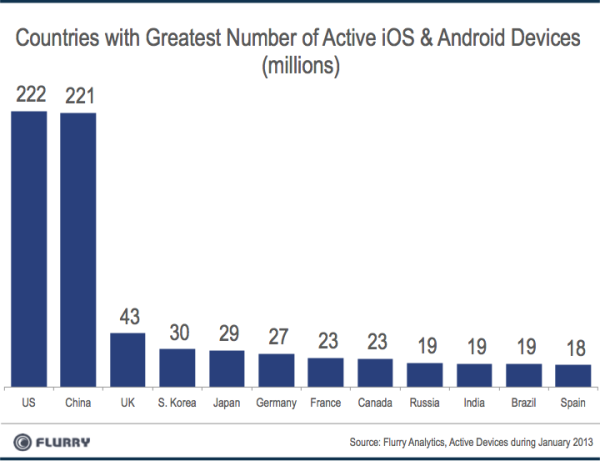 Flurry Analytics, that reliably measures activity across more than 90% of the world’s smart devices, has revealed in its latest report that China has knocked off U.S. to become the world’s top country for active Android and iOS smartphones and tablets. In its previous report, Flurry said that China has the fastest growing smart device market and since then, the country has closed the gap on the U.S. in less than a year. Flurry has obtained its data by tracking more than 2.4 billion anonymous, aggregated application sessions per day across more than 275,000 applications around the world. 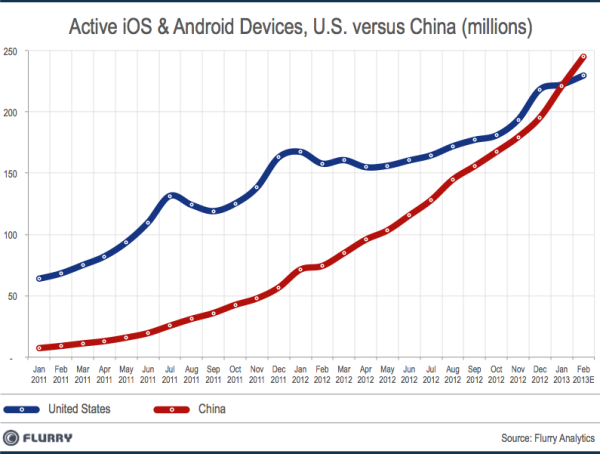 The firm estimates that by the end of February 2013, China will have 246 million devices compared to 230 million in the U.S.. The source also says that the U.S. will not take back the lead from China, given the vast difference in population per country. China has over 1.3 billion people while the U.S. has just over 310 million. Considering that the U.S. has the worlds’ 3rd largest population, the only other country that could feasibly overtake China sometime in the future is India, with a population of just over 1.2 billion. However, with only 19 million active smart devices in India, China will not likely see competition from India for many years. Below, we show the top 12 countries by active iOS and Android installed base through the end of January 2013. Regarding the smart device market growth, Flurry notes that countries which grew faster than China over the last year were Columbia, Vietnam, Turkey, Ukraine and Egypt.